For other uses, see Candle (disambiguation). Candling is a method used in embryology to study the growth and development of an embryo inside an egg. The method uses a bright light source behind the egg to show details through the shell, and is so called because the original sources of light used were candles. 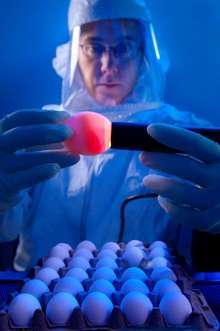 The technique of using light to examine eggs is used in the egg industry to assess the quality of edible eggs. This technique can also be used to assess the quality and development stage of certain translucent plant seeds, especially those of Lilies and their close relatives. Ripe, viable seeds have a visible embryo within them when viewed in transmitted light, so good seeds can be sorted out from the non-viable seeds and chaff, if desired. Candling is a highly useful method with certain species that germinate erratically or very slowly, as seed germination causes the embryo to enlarge. Candling can thus be used to estimate the optimal time for planting seeds that are being stratified. Care must be taken during candling, as drying or overheating will kill the developing seeds. ↑ "Candling Eggs". University of Illinois Extension. Retrieved 2012-06-06. Eggs are candled to determine the condition of the air cell, yolk, and white. Candling detects bloody whites, blood spots, or meat spots, and enables observation of germ development. Candling is done in a darkened room with the egg held before a light. The light penetrates the egg and makes it possible to observe the inside of the egg. Incubated eggs are candled to determine whether they are fertile and, if fertile, to check the growth and development of the embryo. ↑ "Pacific Bulb Society - Lilium seeds". Pacific Bulb Society. Retrieved 20 February 2016. Pacific Bulb Society - Information about candling lily seeds.